a lung tissue structure, varying in thickness from 0.4 to 2 μm, through which diffusion of oxygen and carbon dioxide molecules occurs during respiration. It consists of an alveolar cell separated from a capillary cell by an interstitium and is essentially a fluid barrier. The alveolar epithelium, interstitial space, and the capillary endothelium barrier that gases must cross in respiration; it is approximately 1 mcm thick in healthy people and normally represents only a minimal obstacle to gas diffusion. Alveolar-capillary membrane gas conductance: a novel prognostic indicator in chronic heart failure. In permeability pulmonary edema, pathophysiological disruption of the alveolar-capillary membrane is the basis for the exudation of fluid into the pulmonary interstitium and ultimately into the lungs. The fibrosis and scarring thicken the alveolar-capillary membrane and impede the diffusion of oxygen from the alveoli into the pulmonary capillary blood. NPPV reduces the work of the respiratory muscles, decreases respiratory rate, increases tidal volume, and enables gas exchange across the alveolar-capillary membrane. 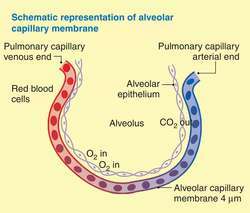 Once oxygen molecules passively diffuse across the alveolar-capillary membrane, they are transported by the blood to the cells of the tissues. Assuming a normal alveolar-capillary membrane, as long as four liters per minute of alveolar ventilation match five liters per minute of pulmonary capillary perfusion, gas exchange will be normal. This article will explore the physiologic basis for hypoxemia by first describing how the diffusion of oxygen and carbon dioxide across the alveolar-capillary membrane occurs, then by discussing the relationship between alveolar ventilation and pulmonary capillary perfusion, and last by presenting clinical implications of [dot.